Apr 30, 2011 1 Comment ›› leoniehaimson Goldenberg’s earlier post on this matter is here. If you’d like to weigh in on whether change.org should continue diverting nearly ALL signers of progressive education petitions to Michelle Rhee’s, promoting the elimination of teacher seniority protections, deceptively entitled “Save Great Teachers,” send a message to ben@change.org and cc. nonprofits@change.org Also check out Rheefirst.org on more on the Rhee record. from Michael Paul Goldenberg, PAA member to Change.org: You’ve likely received other messages informing you of the exchange I recently had with the head of the Michigan Senate Education Committee that was spurred by my mistaking an anti-seniority petition from Michelle Rhee and her associates for one that was actually about SUPPORTING Michigan teachers and public education. That petition was unceremoniously thrust in front of me in rapid fire order after I’d signed a different petition via your site. Normally, I’m rather circumspect about putting my name to something, but somehow the fact that it SEEMED on the surface to be in favor of something I do support (quality education) and that it came via your organization misled me. In future, I will be very hesitant to consider signing other petitions that come my way from Change.org lest I be similarly sucked into supporting Rhee or anyone like her. I consider her to be one of the most dangerous, dishonest people with a loud voice in the fight to privatize US public education. Her group, “Students First,” is hypocritically named and has nothing to do with what it would like to mislead the public into think it is focused upon. Ms. Rhee is about Ms. Rhee and Ms. Rhee’s career and bank account. Rhee’s absolute failure to properly investigate the cheating scandal she helped cause speaks volumes about her lack of principles and willingness to do anything to keep herself in the public eye as another fraudulent “miracle worker.” The only miracle about Ms. Rhee is that she’s still getting away with it. If your group allows her to mislead your readers, I’m afraid you’re going to lose quite a lot of support, at least if I have anything to say about it. Thanks again for getting in touch about your concerns. I’ve made sure your communication was shared with the appropriate people on our team. You can't go anywhere in District 14 without tripping over an elementary school. PS 147 where I taught is within no more than a 10 minute walk - or less - than 4 other elementary schools. But Eva is coming anyway because people want "choice." Ah, "choice" - the buzzword of corporate raiders everywhere. But the end game will be no choice - that's free market capitalism, isn't it? Drive out until you have a monopoly. Just check how we have gone from choice in phone companies after the Ma Bell breakup back down to basically ATT and Verizon. Here is a report from an ed notes correspondent on the follow-up CEC meeting, our final entry of the week of "Eva and District 14." The story will go on as things are brewing that will send more strong messages to the powers that be. Everyone spoke so boldly on April 14 and showed the folly of Eva and her academies. However, Foster was back last night asking for three more co-locations "either for D13 or 14" as was Beginning with Children (Mr. Flowers) asking for another school that they wanted to co-locate. A DOE rep from Portfolio on Charters was also present. (She was not introduced.) There was hardly a soul in the audience. Three CEC members and I asked questions/made comments. The upshot was that D14 does not need any more elementary schools. One male CEC member kept asking why our public schools were not being funded and expanded. The DOE rep said she was not there for that discussion. People want "choice" (that should be a four letter word). Much discussion went on, but it was made clear that the community did not want more elementary schools. Our community schools are on the whole doing well; we have high parent satisfaction; we are meeting the needs or our community were the general agreements of the questioners. Superintendent, Quail pointed out the positives in D14 schools even as he said he had to represent Tweed. He asked, "What does under-served mean?" No one can seem to define this, but the charters say they go into underserved communities. Ms. Wilson (CEC 14 Pres) ) asked Foster what her schools offer the community that is different. She could not give an acceptable answer. Our district 14 schools are declining in population and as children are lured to charters, the public schools lose funds and ultimately programs. All of the schools are planning K-8 charters and it was argued that what is needed in the community are more good junior and senior high schools. There was a lot of dialogue and questioning as well as criticism. This is a Portfolio Planning review phase. If anyone wants to comment they should do it by tomorrow (within 48hours of the meeting) at CharterSchools@schools.nyc.gov I feel that people need to keep coming to these types of meetings to have their voices heard before final decisions are made. Boy, time is flying. End of April already. I hope you've seen some of the videos I've been posting from the District 14/Success Network meeting on April 14. This is the finale. A good question is why when so many charters have impacted on Williamsburg, Success has raised so much opposition? I'm not sure but I may seek to find out some answers. Whatever the reasons, it has been fun to watch. As Success now attempts to add 2 more schools we will watch carefully to see if the resistance crumbles. Today's video is the final one I processed. CEC 14 asks why Success didn't reach out to CEC 14 or why there are not math or reading scores listed for HSA (how are they claiming their schools are such a success?). She reads a letter from Leticia James representing Dist 13 and 14 calling for no more charters in either district. I wonder what other charter chain operators think of Eva who may be killing the golden goose for all of them. Last night's PEP meeting was as disappointing and deeply sad as all the others. Walcott came out in the audience, in an obvious PR move designed for the cameras, to say that he intended to listen to parents and to ask that there be civility in return. Yet as the educrats put forward their stupid, destructive, and irresponsible proposals, one after another, there was little indication that any of them had listened to a single word the audience had to say, and one after another, they were rubberstamped by the Mayoral appointees on the PEP, with no consideration of parents' views or their children's needs. In fact, Walcott and the Tweed educrats continued on their mad and irresponsible course to undermine the quality of our public schools. First up the capital plan, with new seats cut by almost 50% compared to the November plan; despite that now one quarter of all elementary schools now have waiting lists for Kindergarten next year. Last fall, the DOE finally admitted that we needed more than 50,000 new seats just to keep up with new development but there are only 28,000 in this new plan. Though Kathleen Grimm admitted that the need had not suddenly disappeared, she insisted that this is all the city can afford to spend, despite the fact that the economic situation has IMPROVED since Nov., the state reimbursement was NOT capped, and the DOE intends to spend $540 M next year alone on new technology alone. Despite Walcott's claim that there would be a change in attitude, the result was the same arrogance and refusal to consider the obvious overcrowding crisis and the need for more seats. The plan was approved without any questions, except from Patrick; and the PEP mayoral appointees voted like the puppets they are, in lockstep to approve. Then there were hundreds of parents/students/teachers begging for their transfer school – Bronx Academy High School -- to be saved. The students, some of whom were in tears and had been sent there from other closing schools, were eloquent, explaining how the school had turned their lives around. And as usual, total arrogance and refusal to consider their choices from the Walcott and the educrats at Tweed, with the mayoral appointees voting in lockstep to close the school. Parents from IS 303 in Brooklyn – bringing petitions with 11,000 signatures, pleading that Coney Island Prep charter not be allowed to invade their school and take their kids classrooms away. And as usual, total arrogance and refusal to consider their choices from the DOE, and the mayoral appointees, voting in lockstep, like the puppets they are. Three more schools will begin closing next year, following a vote by the citywide school board last night that brought the total of schools closed this year to 27. Members of the Panel for Educational Policy voted to close two transfer schools — Pacific High School and the Bronx Academy High School — as well as P.S. 30, an elementary school in Queens. It was Chancellor Dennis Walcott's first panel meeting since Mayor Bloomberg named him to the post. Walcott said he hoped to change the tenor of the meetings by answering parents' questions and publicly debating policy issues at a deeper level than his predecessors did. Walcott began the meeting by walking down from the stage and into the crowd, where he promised parents, teachers, and students that he and his staff would respect them. "You will never hear me be disagreeable with you," he said. "The one thing we understand is these are emotional issues for you…the approach we're going to take moving forward is be responsive to those issues even when we don't agree." If audience members heard Walcott's plea for civility, they betrayed no signs. The boos and catcalls that have peppered panel meetings for months reappeared last night, as did animosity between charter school supporters and the district schools they will have to share space with next year. Wearing light blue shirts, parents and teachers from Coney Island Prep Charter School sat across the aisle from parents of students and teachers at I.S. 303, who wore orange shirts. Per tonight's panel vote, Coney Island Prep will move into I.S. 303′s building next year, claiming classrooms that the middle school's teachers said they need for high-needs special education students, but that city education officials have decided they can do without. Throughout the evening, parents and teachers from the two schools traded shots over which was the better school and why the charter school couldn't move to another building. Of the three schools that the panel voted to begin phasing out next year, Bronx Academy proved the most controversial. A large group of students, parents, and teachers attended the meeting tonight to defend the school against closure, citing its students' improving credit accumulation and Regents passage rates. In the last seven years, Bronx Academy has seen four principals come and go. It is currently on the state's list of persistently low-achieving schools. Yet in September, the school began the process of transforming itself. It was given a new principal, Gary Eisinger, and it formed a partnership with Good Shepherd Services, a community-based organization that offers students counseling and support. Bronx Academy also switched from semesters to trimesters, allowing students to 18 credits a year instead of 14. "I've worked in transfer schools, and I've never seen a principal work this hard," said Kevin Towns, an advocate counselor with Good Shepard. "The data you're [the DOE] using is from the old regime. These people have been here eight months — let's be real." But Department of Education officials said that they had seen enough of the school's progress to decide that it wasn't enough to justify keeping Bronx Academy open. "The principal has come into a tough set of circumstances, and you do see the impact of his leadership in that school," said Deputy Chancellor Marc Sternberg. "Even if there has been improvement, it's well below what we expect to see. And well below what we see across transfer schools citywide." Senior Deputy Chancellor Shael Polakow-Suransky said that only two-thirds of Bronx Academy students were showing up to school every day and only a quarter are passing their Regents exams. Many students are still earning too few credits to graduate on time, he said. "What I'm seeing is the culture in that school has changed and that is powerful and that is what has generated the positive energy, but the academic expectations have not changed," Polakow-Suransky said. Anita Batisti, who directs Fordham University's school support organization, which oversees Bronx Academy, said she couldn't understand why the city would want to close an improving school. "I ask you, please give us more time," she said. Monica Major, the panel member appointed by the Bronx borough president, said the DOE was rushing to close a school that was just beginning to show signs of improvement. Although Major proposed that the panel table its plans to vote on the school's closure, her motion was voted down. The panel also voted to open a new transfer school called Bronx Arena that will replace Bronx Academy. "Marc, I'm really hoping Arena only gets eight months, the same amount of time you gave this school," Major said to Deputy Chancellor Sternberg. Asked after the meeting whether eight months would be enough time to judge one of the city's 11 transformation schools — many of which have been given new principals and support after years of little progress — Walcott sidestepped the question. Let me take a brief break from out coverage of the Success Charter Network Traveling lie and misrepresentation show to bring you a message from Arthur Goldstein, chapter leader of Francis Lewis HS, the school that Dennis Walcott graduated from and which he has sat by over the last 9 years as it has double the number of students with many crowded in trailers. Did Walcott ever have to eat lunch at 9AM? It is very important that we all stand for our school on Friday, April 29th, right out in front at 4 PM. Let's tell Mayor Bloomberg that we are serious. We will have some special guest speakers, including Senator Tony Avella and UFT President Michael Mulgrew. Please wear your UFT shirts. This is what they are for. If we don't stand up for ourselves, I guarantee no one else will. We're in the Daily News. Here we are at yournabe.com. WPIX put Lewis on TV. Chancellor Walcott is not worried about class size, a good thing, because his clever plan to lose 8.2% of working teachers will certainly cause class sizes to explode. He estimates this will be by 1-1.5 students per class. That's ridiculous, and even if it weren't, I've counted hundreds of classes at maximum in our building alone. Here we are in the Queens Chronicle, in the Queens Courier, and in another piece from the Chronicle. When Walcott said, in response to my question, the budget was so bad we couldn't afford to waste the 3.1 billion dollar surplus on teachers, I pointed out that Bloomberg estimated the savings in the reduction of the education workforce to be 369 million, a fraction of the surplus. He spoke for a long time, but did not respond directly. The annual Open Market Transfer Plan period began on April 15. The plan offers all pedagogues and paras access to job openings throughout the city through an online registration process. During this period, which ends August 7, you do not need a release from your principal to change schools. You may even apply to schools without current openings, and your application will be kept on file until an opening occurs. The Open Market Q & A on the UFT Web site offers more information about the process. Also, please note that full-time and part-time physical therapists and occupational therapists can now use a separate online application system to apply for vacancies on the open market this year. A letter from the DOE is going out to all OTs and PTs with details about vacancies and how to apply. Make sure to watch this video when you get back from the wedding - look for me in case I decide to fly over. This interchange is priceless. Juan Martinez asked if Success would share the names of those 1400 Brooklyn parents. Hey, if they are going to claim the right to expand due to "demand" based on these people who signed up, they should have to share the names and we should be able to ask people if they just signed up for information. At the end there's even a section with some old retired teacher who put down the video camera for a few minutes. Reminder: Tonight is the PEP at Prospect Hts HS where loads of charters will be shoehorned into public schools. GEMers will be there. Join them. I was so proud of my old school when these 2 teachers, Ben and Michael, stood up and challenged HSA. Too bad the sound is not good, so listen carefully. I only met these guys once or twice but how nice to see the next generation of teachers who "get it." 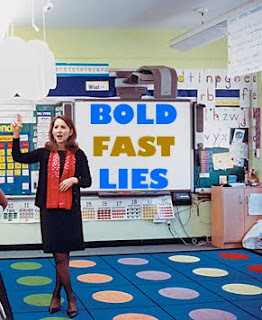 There are many who believe that Eva Moskowitz’s schools represent the kind of change we need in education, and this is certainly the message Moskowitz spends millions to market. However, the reality is far different. At this CEC meeting I witnessed two Success Academy staff members avoid answering community member's questions and make numerous false statements—all in the hopes of preserving their image. Before the CEC meeting began, we received word that Moskowitz would not actually be present at the meeting—she would instead be sending a couple of her marketing staff members to field questions and give her presentation. The meeting began with a small crowd seated in the auditorium of I.S. 71. After a rousing performance by the P.S. 257 marching band and a few CEC announcements, the microphone was given to a Success Academies employee, Nicole Foster. As she took the microphone, parents, teachers and principals in the crowd held up large signs expressing their opposition to Success Academy schools coming in to District 14. Before Foster even began speaking, the CEC president brought forth some concerns about the way in which this meeting was scheduled and pointed out some glaring errors on the part of the Success Academies staff. Right from the start, it was clear that this was going to be a tough crowd for the two, young Success Academies staff members. Ms. Foster began by thanking us all for being there and stressed how excited Success Academies was to be coming to District 14. They were, she claimed, attending this meeting in order to start a "respectful dialogue" with the community. Yet, she did not address Moskowitz's absence. How important is dialogue with the community to your organization if your own CEO doesn't show up to meet the community? She talked briefly about her background, the Success Academies philosophy and their plans to open more charter schools in District 14. Next, she called upon two Harlem Success Academy parents to speak to the audience. They told brief stories about why they believed so strongly in their school. The two parents certainly seemed excited about their schools; however, they didn't refer to anything very specific about why their schools were so extraordinary. It seemed an odd move bringing in these parents. 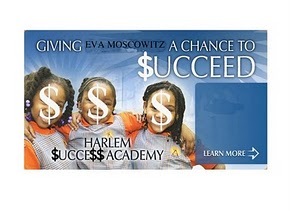 If there was, in fact, such a high demand for these Success Academies (as their staff members claimed), why bring parents in from Harlem to convince us? Soon after the parents finished their presentations, the crowd had a chance to ask some powerful and critical questions. Throughout this back and forth, the Success Academies employees tried to make nice and appear gracious and respectful, but they were challenged by the community's questions and struggled to communicate anything more than half-truths. One of the first questions was about why Success Academies felt any need to come to District 14. Foster responded that there was "demand" for their charter school. When asked to explain this demand, Jenny Sedlis (Director of External Affairs) joined her colleague at the front. She claimed there was a demand because 1,400 families had entered the lottery for the 168 spots available at their school slated to open in District 14. When probed further and asked repeatedly how many of these applicants were actually from District 14, Sedlis became flustered and said that all the applicants were from "Brooklyn." Success Academies is claiming a false demand for their schools. It is not accurate to say that there is a demand in District 14 for this school, if the applicants do not actually live in the district. Success Academies choose District 14; the district did not choose them. Foster’s response was evasive at best. She spoke lightheartedly about how their network has reached out to the community and daycare centers in the past. She failed to address any of the teacher’s concerns, but instead kept referring to how Success Academies is trying to engage, now, in a dialogue with the community. (Let’s not forget that the lottery for their school closed on April 1st. Seems like it might be a little late to be starting this dialogue.) While Foster put on a smile to respond to this public school educator, the outright disrespect her organization showed towards PS 147 (and so many other public schools where they do the same kind of soliciting after/before school) cannot be denied. While his school is in the midst of doing something positive and productive--conducting meetings between teachers and families--Success Academies shows up to tell these parents they should consider another school, creating confusion and sowing seeds of doubt. Another educator from PS 147 challenged the Success Academies model. He spoke of high teacher turnover rates in their schools, and cited a case in which one Harlem Success Academy went through four principals in just five years. He asked Ms. Foster, “How can your school be a replicable model?” as they so often proclaim. He spoke also of their contradictory statements about testing and test prep. While they claim not to be a "test-prep" factory, their teachers don orange t-shirts with the words, “Slammin’ Exam Teacher!” Furthermore, the PS 147 teacher alleged, the schools’ CEO, Ms. Moskowitz, has openly advocated for rewarding teachers monetarily for high student test scores. Foster's response to teacher turnover was even more misleading. She said that many of the teachers at Success Academies don’t leave, they simply move on to other positions within the network. She didn’t exactly specify what jobs these teachers took up, aside from mentioning a few school leaders who were former teachers. 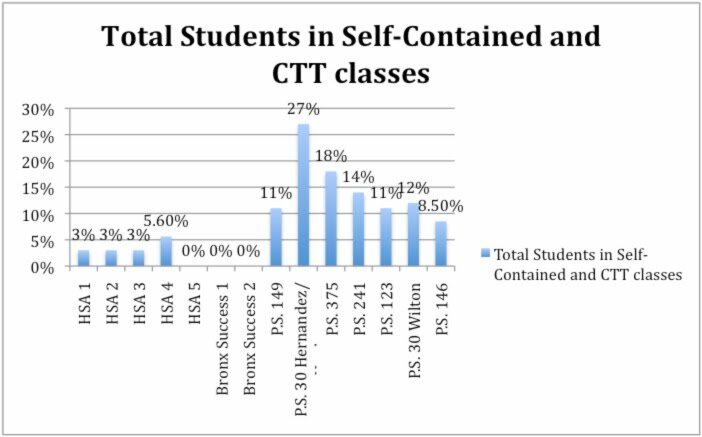 Surely the 50% turnover rate at Harlem Success Academy 1 (see for yourself on the State’s Accountability and Overview Report) is not due entirely to teachers becoming principals. Some teachers likely do move up, but what happened to the rest of them? He spoke also of the numerous injustices his school and students have been subject too since the co-location began. Each year, Harlem Success Academy has taken more and more space away from his public school. Kindergarten, first and second grade students at his public school have been forced into classrooms in a sub-level basement—all to make room for Harlem Success Academy. Foster attempted to respond, explaining that in each co-location there is a team of people who work together within the building to divide space equally and fairly. The Harlem educator responded and shared how his school community consistently and opening opposed the move to basement classrooms, and how, in the end, they were not allowed to be a part of this decision. They were told to move their classes into the basement. Foster continued to stress how her schools work in partnership with their public school neighbors. It is easy to say you partner with a community or a school, but to actually do it requires a degree of honesty and consideration Success Academies have not shown themselves to possess. Partnership requires a give and take; Success Academies only know how to take. As the evening continued, a consistent pattern revealed itself. The community raised concerns. Then, Sedlis and Foster deflected and attempted to minimize what the community brought forth. The most glaring untruths came later in the evening. Someone from the audience mentioned her concern that Success Academies fail to enroll equitable numbers of students with special needs and English language learners. Nicole Foster actually said that the new District 14 Success Academy school will have 25% English Language Learners. She then went on to say that Success Academies enroll more special education students and more ELL’s than the public schools with whom they share space. Her statements could not be further from the truth. Let’s look first at English Language Learner enrollment. New York State complies information on all schools and creates an “Accountability and Overview Report” for most schools in the city. The 2008-2009 reports can be found online. 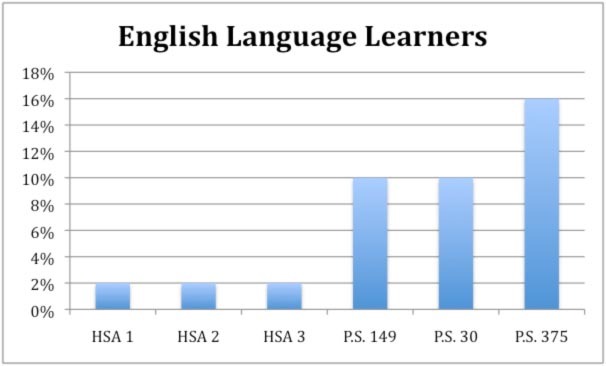 See the chart below to see the enrollment of English Language Learners at three Success Academies and their co-located neighbors. For some reason, “Accountability and Overview Reports” do not yet exist for the other Success Academies schools. Most likely, this is due to their youth—some have only been open a year or two. However, the public schools they share space with enroll significant numbers of ELL students. Foster also claimed that her schools enroll higher numbers of special education students, but the numbers just don’t add up. On the Department of Education website (schools.nyc.gov) you can view all kinds of statistics for each public school in our city. Statistics for charter schools are not as easily accessed. In the beginning of February, I came across a new link with enrollment data on each school’s page. It was titled, “CEP School Demographics and Accountability Snapshot, 2010-2011.” This was, at the time, a snapshot available for all schools—public and charter. I recorded the data for the Success Academy schools, as well as the public schools that have been forced to share their space with this charter chain. Within a couple of weeks, this link was removed from all of the charter school web pages, however it is still available on public school pages. (It is listed near the bottom of each school's “Statistics” page.) The data used in the graphs below comes from these snapshots. If the Success Academies schools would like to provide updated and detailed enrollment information, I would love to see it. 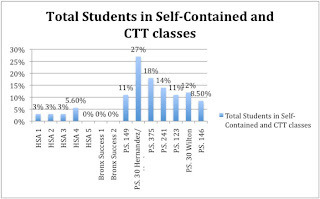 The first graph shows the percentage of students enrolled in special education classes, both Collaborative Team Teaching (CTT) and self-contained classes. 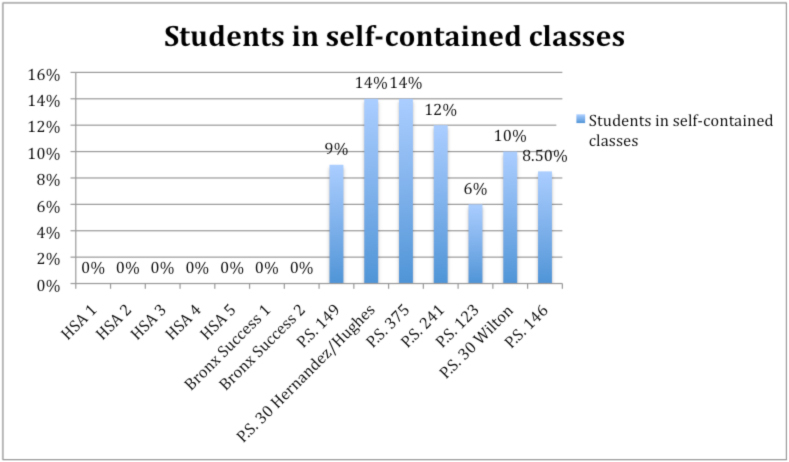 While it is undoubtedly clear that our public schools serve more students in need of special services, the differences are even more glaring if you examine the number of students in self-contained classes alone. 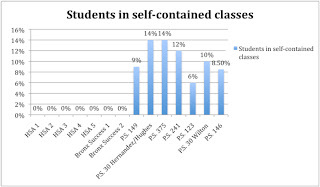 Students who need self-contained classes typically have the highest needs. The job of a public school is to work with all of the students who enroll, regardless of their strengths, weaknesses, needs or shortcomings. When a student presents with a need, it is up to the school to help meet that need. Although they receive substantial public funds, charter schools are not public schools and easily avoid doing the true and hard work of educating our neediest children. As the CEC meeting ended around 8:15 pm, two tired and weary Success Academies employees exited I.S. 71. I wondered, how they do it every day? How do they work for an organization that, in the name of educational equity, creates division, tension and inequality in our communities? Moskowitz invests extraordinary resources in the presentation and preservation of her organization's image. But as one community member said at the end of his testimony, "Imagine if that money went to kids!" 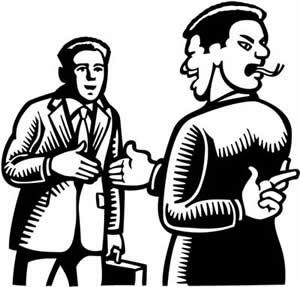 In advertising and marketing, truth is usually obscured or manipulated in an attempt to convince people (consumers) of something--to buy a product, to take a trip, to take a drug, to buy a kind of food, to go to a school. McDonald's spends millions of dollars every year marketing and promoting its food. It fills its advertisements with images of seemingly healthy people stuffing their faces with unbelievably unhealthy food. It slaps up joyous slogans and avoids including the information about their food's damaging nutritional content that might dissuade people from buying it. McDonald's advertising campaigns are not focused on sharing any truths. Rather, they hide the truth in the name of increasing profit. The Success Academies Charter School Network is guilty of similar practices. Moskowitz wants us to believe what her organization says and ignore what it does. But if we ignore what is happening, our children are the ones who will pay the price. They deserve honesty and integrity, not lies and deceit. What is it going to take for more people, especially parents, to see through the empty slogans of Success Academies? Something I have puzzled over: why do hundreds of charter school parents and students show up for public hearings to demand more charter schools? The children are already enrolled in a charter school. They can only attend one school. How will it help them if there are more? They can't enroll in two schools. For whose benefit are they there? What would happen to a regular public school principal if she or he hired buses to send children and parents to demonstrate at a PEP meeting? Yes, Diane. In District 14 we saw 2 HSA Harlem parents shlep to Williamsburg to "sell" HSA. They are being used as a political force. I'd love to see Eva bring buses full of parents in to District 14. They will get some reception. Just finished watching the D14 CEC meeting video on your blogspot. It is wonderful to see principals and teachers speak up on behalf of their schools. Why wasn't that auditorium filled with D14 parents and community members?? Amazing how HSA reps side stepped questions asked by the former school board president. One of the most important questions I have been asking for years as a D6 parent, former D3 employee and now a D4 employee and am still waiting for an answer is WHO asked HSA to come into the district??? Answer: NOT parents or the community as they claim, but the DOE. Deceiving parents and communities by presenting HSA as the "great white hope" has done nothing but caused parents to loose faith in and discredit many of the wonderful traditional public schools in our communities. One of the HSA reps (I cant remember her name) at the D14 meeting talked about the wonderful partnership and relationship HSA has in Harlem with PS 241 and Opportunity Charter School. I can tell you as first hand that her statement is so far from the truth and a down right lie! Children at PS 241 have now been pushed into the basement of the building and are not allowed to use the main entrance which is reserved for use by HSA students and their parents only. There is nothing but infighting between HSA, Opportunity Charter ans PS241 in that building. The same goes in other buildings in Central and East Harlem where HSA is co-located with other schools. The reality is that decisions about co-locations with charters in traditional public school buildings are being negotiated and made way before the proposals are presented to CEC and to parents. Parents and communities are not involved in the decision making process. For the sake of our children, this has got to change. Brian DeVale compliments parents from HSA for being concerned. But why are they coming to Brooklyn to sell their school? He isn't going up to Harlem to tell them where to go to school. Choice? "If you built a crack house people would come." And lots more. I will be sharing a batch of videos this week that I extracted from the District 14 Community Education Council meeting with Harlem Success Academy reps on April 14. It really was a remarkable meeting as HSA faced a unified pushback from all parts of the district. Their tactic of divide and conquer did not work - they didn't bring busloads of parents from Harlem as they are able to do at PEP meetings. This may be the first time HSA is facing organized resistance as District 13 and 14 passed joint resolutions opposing more HSA charters. Of course with sugar daddy WalBloom on their side it may not make a difference, but they will not find the process very comfortable - as you can see in this video. They brag about the 1400 people on the waiting list - all that after months of advertizing all over a wide area of Brooklyn. Now they are using these signatures to justify adding two more schools. Once they get capacity, they then use these parents as political shock troops to steam roller local public schools. I will be putting up an individual segment every day. You will find this 18 minute video worth watching as I culled and edited various interactions between audience members and HSA reps. I repeated a few segments to make a point. Princpal Brian DeVale tells the HSA parents he is happy they love their school in Harlem, but he doesn't go up to Harlem to tell people where to send their children. And lots more. At times the normally cool and collected HSA spokesperson Jenny Sedlis seemed a bit shaken as she was forced to leave her seat to defend HSA. Harlem Success Academy's attempt to push into District 14 in Brooklyn meets with fierce resistance at the Community Education Council (CEC) meeting held on April 14. Principals, parents, and teachers raise fundamental questions about HSA's tactics in inundating wide areas of Brooklyn with slick literature in an attempt to create "demand" they then use to justify pushing their schools into public school spaces. "You may have 1400 signatures but none of them are from District 14," says one speaker. Another challenges HSA to produce their lists. A teacher talks about how HSA paid someone $10 an hour to hand out lit to parents on open school night. CSA leaders say they were lied too. And an educator from Harlem shares the negative experience in his school with HSA as his kids are forced into the basement. Gotham's Anna Philips was present for most of the meeting but for some reason chose not to write about it. Excuse the bad and uneven sound as the amplified echo was heavy duty. In the future, I would hope that the editors of the Times might try a little harder to look at the data with a more discerning eye, and not swallow the distortions of the Department of Education. Perhaps they might even refer to independent experts who could dissect the data if they find it too difficult to interpret it themselves. They owe it to their readers. There is little point in trying to cover the NYC public schools if they continue to prove themselves so incapable of weighing the evidence objectively and presenting the facts with a more practiced eye, rather than simply regurgitating what is handed them by the spinmeisters at Tweed. After all, if the Daily News and the NY Post can do it, why not the Times? The NY Times issues a correction, too little and too late. Upon reading this statement, I immediately knew it to be untrue. There has been little or no improvement in student achievement in NYC since 2006 – or even since 2003, when the Klein first implemented his policies, according to the most reliable national assessments called the NAEPs. In fact, after the NY State Education Department recalibrated the exams, increasing the scale scores needed for proficiency this summer, in response to overwhelming evidence that the state tests and their scoring had gotten much easier over this period, the percent of NYC students at or above grade level actually dropped precipitously compared to 2006. READ IT ALL AT: The NY Times issues a correction, too little and too late. Poor Jonathan Mahler, who called me when he got the assignment and I directed him to Leonie and offered to put him in touch with real teachers. But he went astray and got lost to the data munchers at Tweed. A good lesson for any reporter looking to do a serious article in education in NYC - and beyond. A crisis for teachers union reformers? Hey, if LIFO ends, guess which teacher will stay? Expect Walcott to uphold the Joel Klein tradition of supporting anything any principal does short of being a serial killer. And even that is a 50-50 toss-up. Staff members of a Far Rockaway middle school that once had an A report card grade but has sunk to a low C, charge that the school’s new principal is playing fast and lose with school resources. Records show that Middle School 53 on Nameoke Street received a rating of 96.5 and an A on its 2009 school report card, reporting that more than 60 percent of its students were reading on grade level. In 2010, however, the school received a 39.6 grade, with a letter grade of C. Records show that less than 20 percent of the students were actually reading on grade level. Shortly thereafter, its longtime principal, Claude Monreau, retired and a new principal took over. Staff members, all of whom asked not to be identified because they fear retribution, told The Wave last week that even though the school was “terrible” under Monreau, it is far worse under its new principal, Jacqueline Boswell. In fact, they claim that Boswell has brought some borderline ethics to the troubled school. If you haven't noticed yet, Teach for America and the charter school movement has one major purpose: destroy the teacher union movement. And they are succeeding. The fact that the UFT/AFT/NEA has had rings run around them has left America's urban teachers defenseless. I've been trying to follow this story in Kansas City where senior teachers are being fired and to be replaced by raw Teach for America recruits. I don't have any trouble making this prediction: check back after all unions lose collective bargaining, merit pay is in force and all the other ed deform goodies are operating - there will be not only no improvement, but severe deterioration. Then who are they going to blame? Don't worry, they will find another scapegoat, but never themselves. Of course we will lose another generation of students but why quibble? Sure Steve. It's all about motivation. As for the non-renewed teachers, Superintendent John Covington said he was not passing judgment on individual teachers. There are good teachers and outstanding teachers in the district, he said. But he has publicly recited many times that in more than 75 percent of the district’s schools, less than 25 percent of the students are proficient. And that, he added in a written reply to The Star, “strongly suggests that our overall teaching core is not of a quality our students deserve.” Covington looked to Teach for America to bolster the teaching ranks — seeking at least 150 candidates from the national organization that recruits top college graduates from various fields and trains them to serve at least two years in classrooms. The non-renewals of some current teachers would have happened whether Teach for America agreed or not, he said. The district had considered non-renewing all of its 210 non-tenured teachers and letting them reapply for positions but chose instead to make decisions based on what teachers had in certifications, specialized training, curriculum-writing experience and other assets to fit the district’s “reorganization.” The non-renewed teachers who gathered last week took stock of the many instances of dual certifications, master’s degrees, and curriculum writing among them and had trouble seeing the method in the district’s decisions. I haven't stopped crying for two weeks. I taught with four of the teachers who bravely volunteered to be interviewed for this piece - all great teachers. One of them asked me to come and sit with her for the interview. The reporter had contacted our union to arrange the interview and was hoping two or three would show up and there were 17. They sat in a circle around a conference table and each one told her story. It took over two hours and I had to leave the room several times to stand in the hall and cry. Then two days later I sat at a conference table with our superintendent, school board president and Claire McCaskill, listening to those two men trying to impress a US senator. I wanted to gag. This has just been devastating. Our profession is under attack. I'm so angry I am going to need therapy. Are any of you planning on attending the march in DC in July? It looks like it could be huge. AFT signed on to sponsor this week. NEA is likely also going to sponsor. the vast majority of teaching staffs are women, the vast majority of those attacking teachers are men. Are these men afraid of what women have achieved through education and negotiation? Or, is this a conservative, religious belief driven attack? Education Deformers Ignore "The Street"